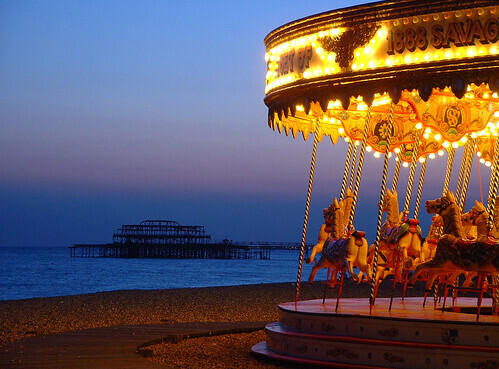 After the success of the last BrightonSEO, I’ve been itching to arrange the next one and I can now reveal that the next BrightonSEO will be taking place on Friday July 23rd. Again it’s going to be a free event with interactive talks from members of the SEO community, I’ve already started arranging the speakers, although I can’t guarantee we’ll be featured in the Guardian again, it’s already it’s shaping up to be a great line up, but we still have slots available. If you think you can talk for 15 minutes on a topic which will interest an passionate and advanced SEO audience drop me an email at kelvin.newman@sitevisibility.com, especially if you’ve never spoken at conferences like SMX & SES we want open the floor beyond the usual suspects. So that’s the low down for the moment, the UK’s most friendly SEO event is back on July 23rd, You’ll get an afternoon of high quality talks on SEO and related topics and an evening in one of sunny Brighton’s finest drinking establishments. So get it in your diary! Sadly I won’t be able to make it – would love to be there as I train SEO for Silicon Beach. Will definitely try to make the next one. Oh Yeah, I’ll be there! Will be there – really enjoyed the last one! Looks enticing! Pretty sure I’ll be there. Can’t wait, see you all there! Be visiting from Oxfordshire but sadly won’t be able to stay for the evening this time. I will of course be there. I’ll be there. Looking forward to meeting you guys. Hi Kelvin, thanks for organising another of these. Any updates on arrangements in terms of times and stuff? Count me in for the afternoon, 2ish onwards.